Here is the first Trev Report in a couple months. Enjoy! Hello everyone and welcome to the first Trev Report in two months! A lot has been happing here in Japan for Signe and me, so let’s get on with the report! Signe and I are doing great! She has been very busy as of late. She has ended her weekly cake-baking job to work as a part-time English teacher at a local High School! One day a week she goes to the High School and helps teach advanced English classes and corrects students’ papers. Signe has also picked up a hobby. She is really into sewing and wearing kimono. She has already made one full kimono and she is working on another one as we speak. You can see her finished works at http://www.signerose.org/ . Besides that, things have been going along as usual. Signe has discovered BitTorrent, so we download movies from the Internet and watch them here, which is nice when a theater ticket price is around 1800 yen per person. Work is going great for me. As most of you know I have signed on for a second year on the program, so we will be living here at least until August 2005, but I full intend to stay much longer if at all possible. Last week we had a three-day training conference in Kobe (near Osaka in the Western part of Japan) and I picked up a lot of useful tricks and tips on teaching there. I teach at nursery schools, elementary schools, and junior high schools and there were panel discussions on all three at the conference so I have come back with a lot of fun new ideas for teaching. Another event at the conference was a speech by one of the original JET Program members who has been living in Japan for about 20 years now. He talked about staying in Japan for the long term and the trails and benefits of doing so. I was very inspired by his speech and have asked for a transcript of it. When I get it I will make sure to post it somewhere for reading. The other big work related news is that I was selected to be a volunteer at this year’s Tokyo Orientation for incoming JET participants. There will be about 6000 new faces, and only two people from each prefecture in Japan were chosen to assist with the event. As many of you know I love manning large events like this, so it is quite a treat for me. That is coming up at the end of July in Tokyo. I am also still writing a monthly article in Japanese and English for the town newsletter. I write a one page article every month and talk about different issues like diversity, teaching, and other things like that. I will bring them to America to show off when I return in July. My TV show has been on hiatus for a few months while we find new Japanese hosts, but the search is over, and we should start up recording the monthly show again this month. Well, I’m not the biggest fan of taking vacations but, when my best man, Scott Francis came all the way to Japan to visit us, I just had to take a week off to hang out with him! Last month, Scott flew into Osaka, and he and I toured the Kansai (western) region Japan. We went to Osaka and checked out all the cool arcades, the famous “Den-Den Town” electronics district and went to many shrines in the area. Then we went to Nara, the home of the Great Buddha, a 15 meter tall bronze statue in housed in the largest wooden building in the world. It is a beautiful city full of very tame deer (you can pet them and they eat out of your hand) and wonderful sites. We met up with Signe there and then headed off to Kyoto for the day where we saw the famous and always populated Shijo Street with it’s unique blend of old and new mixed together like only Kyoto has. After the crazy Kansai romp we all headed back to the sleepy town of Akagi up in the hills of Shimane Prefecture for a few days of rest and relaxation. There are many beautiful waterfalls in the area, so we took Scott to see one. I even took him to one of my elementary schools to see when a Japanese elementary school library looks like for his mom, who is an elementary school librarian. The kids got a kick out of seeing a new face in the hallways as well. Our last day together we all went to the capital of Shimane, Matsue, to see our local castle, Matsue-jo, it was fun seeing a real castle and Signe and I hadn’t even been there yet. With that we sent Scott on his way and it was back to the old grind for us. Many of you already know this, but we are coming home for most of July! We will be in the Seattle area from June 29th to July 13th and in the Bay Area from July 13th to July 18th, we are returning from Seattle to Japan on the 19th. We are planning on attending Danielle and Johan’s wedding in Olympia (they are friends from college) and Mike and Tina’s wedding in Santa Clara where I get to be the best man!!! (Mike Chu is a good friend from High School and we have grown closer over the years). I am really excited about seeing everybody again. I am really scared that my Japanese will go all the hell (which it will) but as they say in Japan “sho ga nai” which I like to translate into “what can ya do?” with a apathic shrug for emphasis. Man, it seems like my Japanese isn’t getting any better. There is always someone that is better than you, but I try my best everyday. Actually, the only days I seriously get to speak in only Japanese is when I am at an elementary school, nursery school, or at the board of education. I only have those days twice a week. The other three days I work at the junior high school where many ofhe teachers like to speak in English. So I mostly communicate in English, which is great for the other teachers, and I am glad that I can do that with them. I also speak nothing but English at home with Signe as well. Her Japanese is improving like no one’s business though. She is doing great. I was recently discouraged a little when I noticed that an ALT in a neighboring town who didn’t have any Japanese knowledge when they came here has improved to a level near mine. I was also put down when I was in class and I realized that I started studying Japanese seven years ago, but don’t have all that much communicative skill to show for it. Of course, I still write daily in my diary in Japanese, but the level of my entries has stayed the same 3rd grade level for quite some time now. I will continue to do my best though. I really want to master this language, and I still find studying it fun and rewarding, so I will persevere! I haven’t done much on the anime front as of late. I have been playing a few games like rRootage, http://www.asahi-net.or.jp/~cs8k-cyu/windows/rr_e.html , which is a really great fan-made shoot-em-up (or shmup for the fans out there). Signe and I both have been banging away at Yoshi’s Island for the GBA as well. I’m on level 4 and Signe is on level 5. Dom got it for us as a present when he came to Japan to hang out with us. That is a really fun and addictive game. There are a few shows I really want to watch, but the last show I really watched was Gundam SEED. I love that show, even though it is a rehash of the original Gundam, they did a great job and the characters and mechs are cool, especially the M1Astray. That is an awesome mech and by far my favorite. I have also founded the AJET Anime and Manga Special Interest Group at http://groups.yahoo.com/groups/AJETAMSIG/ . 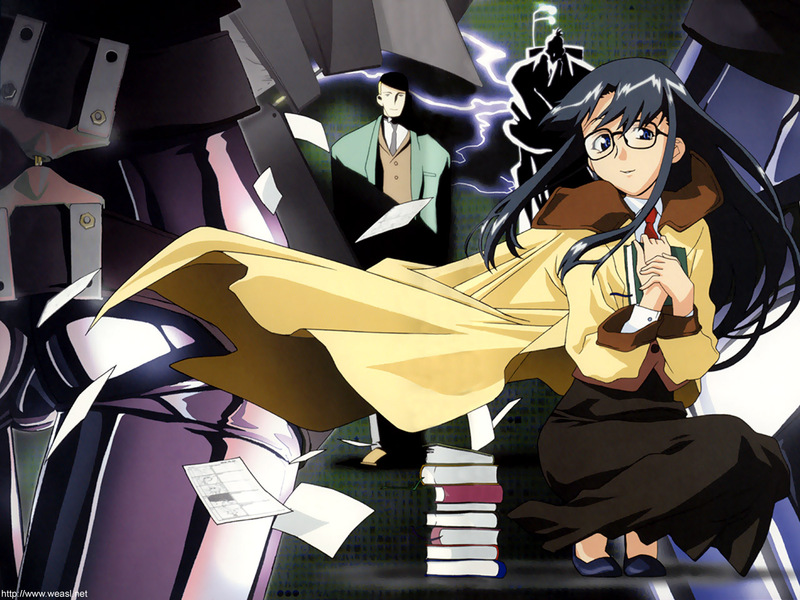 It is a group where we talk about anime and manga and how we can use it to help teach kids English, as well as a gathering place for fans of the arts. The laptop is working great. We have it connected to the TV and watch many TV shows/movies we download on it. We recently watched Dead Like Me, which is a great show, among others. I have had the same background (http://www.trevreport.org/images/background.jpg ) on my desktop for years. 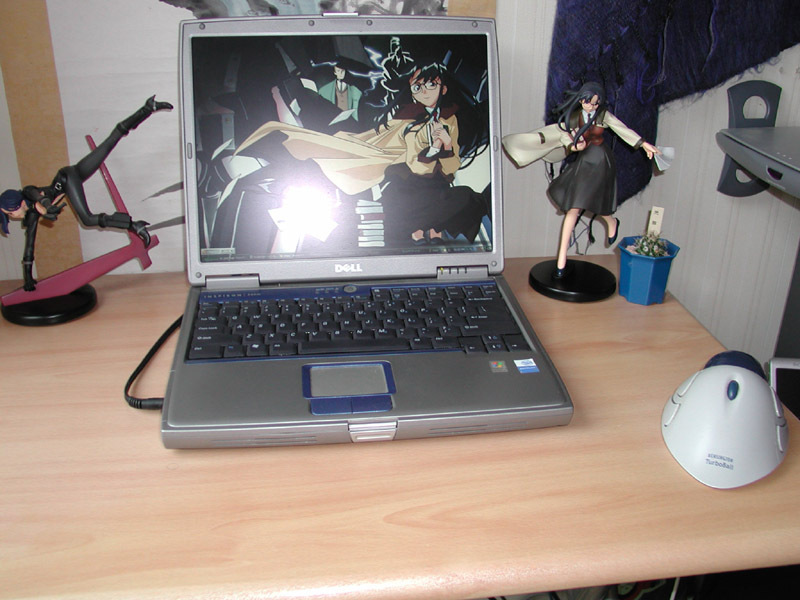 It is accompanied by my figures of Yomiko and Nancy next to the computer (http://www.trevreport.org/images/laptop.jpg ). Thanks to Robert Loo for sending “the girls” to me all the way in Japan. I recently saw one for sale in Kobe and it was pricier than the ones Robert sent me! Actually I have been MUDding a lot lately. A MUD is a Multi-User Dungeon. It is basically an online fantasy text-based video game, where many people from all over the world come and play with each other. The MUD I am currently playing is called Achaea (http://www.achaea.com/ ), if any of you ever come on, my name in the Achaea is Ilimlza. I am a Mhun (underground dweller) in the Jesters Guild. I really like the game, the people are great and the environment is fun to play in. I have been trying to relearn programming as well, but I am not too inspired these days, so it is tough. I play around with coding every now and again, but I am not doing any serious projects. It seems that my computer science days and my multi-thousand dollar CS degree is going to the wayside, but I’ve no regrets, I couldn’t imagine being anything but a CS major in college, if for nothing else, the friends I made through it. Ringo ga hoshii desu. – I want an apple. Bi-ru ga hoshii desu. – I want a beer. Kuruma ga hishii desu. – I want a car. Pretty easy, huh? Well keep up the hard work and I will see you all next time. That is about it for this edition of the Trev Report. I hope you all enjoyed it. I know I did. I am looking forward to visiting a lot of you next month, so I see some of you then. For the rest of you, drop me a line sometime. I always like hearing from you all. Hey Trev, this is your loyal follower Dave, out in sunny San Jose, California. I hope all is well, and I still miss you guys a bunch. Maybe I'll call again and chat with you this time. But Signe is cool to chat with too. Also, please, please, please call me when you are in San Jose, I totally want to see you both. Oops, it's 5:45 am, time to go to work. Later. You bet I will call you when we get to California. I want to see if we can find time for dinner or something with some of the Fanime staffers. This is what you missed out on FanimeCon 2004!! Wish you/Signe well! !